i am working on a project and need your help! You might try the dupliframes. Warp should work, maybe you were in the wrong view? Or not all verts selected? Wrong pivot? Maybe try a curve modifier. I forget the name of the tool, but you want to use Shift-W.
You need to center your stairs and line this center up with the center of your silo. Place the stairs at the height you want, and with the stairs just touching the silo. Next, place the 3d cursor at the center of the silo, select the stairs and enter edit mode. 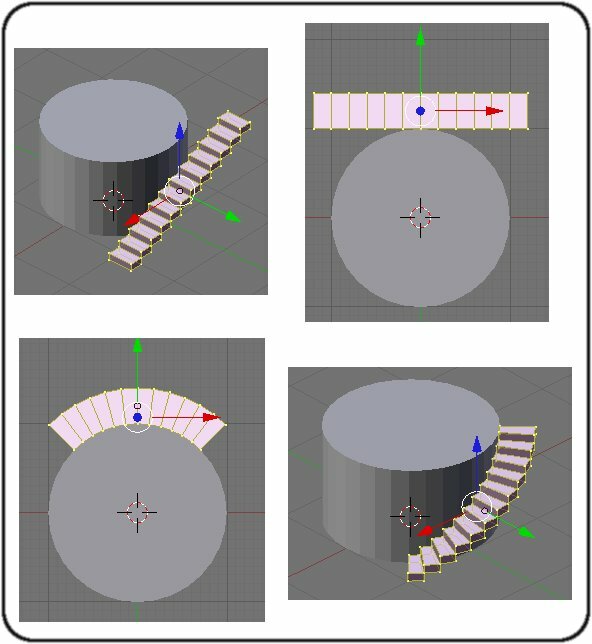 Making sure all the stair verts are selected & that you are in top-view (num7 key), hit shift-w. Use your mouse to adjust the amount of curvature you want, and you’re done!! - Note, the curvature is done around the 3d cursor, in the orientation that the viewport is in - hence you must be looking straight down or straight up for this to work. wow baby! the curve modifier is magic! that’s EXACTLY what i needed! thanks a lot! @enhzflep: yeah, that’s the warp tool. and i was in top-view, cursor centered. hm. something weird is going on… anyway, problem solved. Like Inmare said Curve Modifier should do the job. I only coud add that the curve should be Bezier Circle with the width of the cylinder. If the bending is in the wrong direction use Switch Direction option for the curve. Your mesh must be horizontal, as much as possible: this function is view related. The Array modifier would also be good for this. Model a step and position it at the side of the tank. Snap it’s object centre to the centre of the tank. Add an Empty at the centre of the tank. Add an Array modifier to the step and set object offset with the empty as the object. Move and rotate the empty on the Z-axis to position the next step. Increase the count, each count increase will create a new step spiralling around the tank. Indeed it would especially since it can use a path and because it can fuse one element to the next beautifully. It could be combined with the dupliframes and even the extrusion by BevOb (for the railing for example). All of this could use the same single path. and the array wouldn’t work with the - once again my vocabulary fails - interruptions? offsets? ( well, look at the reference pic). so the point of this weird post is: curve-modifier rules!